Homeowners who want a fuel and heat efficient gas fire with low maintenance and little or no work involved in operating it find that the Crystal Fires Option 1 hole in the wall gas fire meets their needs perfectly. 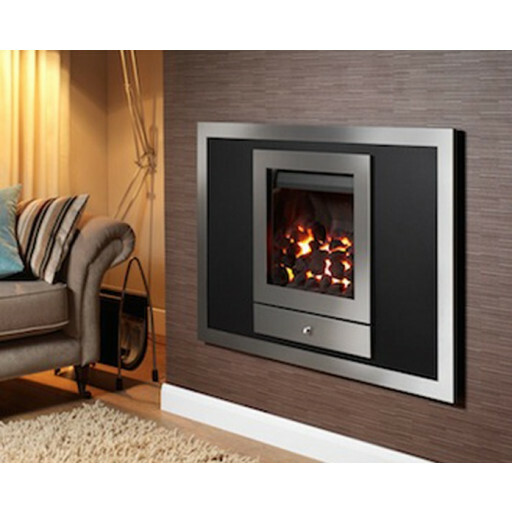 This Crystal Fires range offers five interchangeable facias, along with a choice of having the fire be either open fronted or glass fronted for improved energy efficiency. Because the Crystal Fires Option 1 hole in the wall gas fire is available as standard as a manually controlled gas fire, but a remote control option is also available for even further convenience. The living flame effect comes from a choice of a decorative fuel bed featuring ceramic coals or pebbles in the open fronted model, or driftwood in the glass fronted option. The outer trim colour of high quality brushed steel or chrome is matched with a background colour choice in either black or cream. Crystal Fires Option 1 hole in the wall gas fire is also a low cost, high-quality gas fire choice, featuring up to 81% heat efficiency.